This product is oversize and will not be eligible for free shipping. Dogs will love to cozy up on the Montana Nap Pet Bed by West Paw Design in Plaid! Perfect dreams start with the perfect bed! Made from soft and cozy fabric, the West Paw Design's Montana Nap® pet beds are where dreams begin. Unlike other dog mats on the market, these custom designed fabric has a poly-knit backing that interlocks the fibers to add strength and reduce shedding without sacrificing softness. Extra layer of padding is comprised of 61% recycled IntelliLoft® fiber batting, which is carefully sewn inside to eliminate bunching and create a raised edge for added support and comfort. 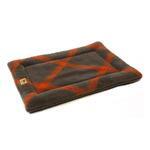 Earth tone colors make these mats the perfect companion in any environment. Made to be compatible with standard size kennels. Entire Montana Nap® is a one piece easy-to-wash dog bed that stands up to multiple machine washings. Made in Bozeman, Montana, USA. Matching Berber Bone, Madison Moose Dog Toy sold separately. X-Small: 20" x 15" x 2"
Small: 24" x 18" x 2"
Medium: 29" x 20" x 3"
Large: 35" x 22" x 3"
X-Large: 42" x 27" x 3"
Love shopping here. We wish there was a size between XL and 2XL but we stay warm in the winter!